It started as a night like so many others in Sarajevo. A group of friends had filed into a downtown flat for cocktails and catching up. It was the summer of 2010. The crowd was mostly actors, artists, musicians — among them Irhad Kuduz, a classical guitar teacher, and Zana Marjanovic, an actress who’d scored a starring role a couple of years prior in “Snow,” a Bosnian film that snagged rave reviews at the Cannes Film Festival. The talk that night, as Kuduz recalls, was variegated and profuse. Somewhere along the way it turned to the early 1990s, to the years when Sarajevo was a city given over to ethnic violence. Ironically, those years had also witnessed a flowering of creativity in Sarajevo, as war-wearied locals embraced the arts as a kind of antidote to conflict. The chatter became a lament for the past, for how art, for that brief interlude in Sarajevo, seemed not merely a diversion but a way to connect, a way for locals to feel truly alive. By night’s end, the friends had turned their powwow into an impromptu cabaret, the apartment into a theater. They sang and acted out improvised scenes. They told stories and jokes, laughed and applauded, laughed some more. To hear Kuduz and the others who were there tell it, the atmosphere was magical — akin to one of those feted evenings in the salons of Paris in the 20s or the pubs of New York in the 50s, a night with energy enough to power a movement. In the days that followed, Kuduz, his sister Naida, and Marjanovic started wondering if such an evening could be replicated on a more public stage in a city where rock and roll, synthesizer-laced electronic folk music, and bass-pumping techno was du jour entertainment. 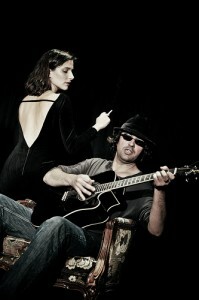 Actress Zana Marjanovic and blues musician Damir Niksic perform. The moniker takes cues from the small storage space connected to the café that houses their props and costumes. According to Kuduz, the name also refers, on a more abstract level, to a place where one can resurrect “some old idea.” In this case, the old idea is cabaret. Sarajevo, the capital city of Bosnia and Herzegovina, is a bustling yet quaint mountain-ringed town. Due to its topography and laid-back populace, it feels like a first city and an alpine resort at the same time. Café Gogo is on the ground level of a sprawling retail and residential complex in Ciglane (“Brickyard”), a neighborhood to the north of Sarajevo’s city center. The buildings, which occupy the site where a factory once produced bricks, terrace up the hillside, Lego-like. In front of the café there is a sprawling cemetery. Across the street sits a sports complex that figured prominently in the 1984 Olympic Winter Games. Unlike the seedy districts where cabaret has taken root in other European capitals, Ciglane is thoroughly middle-class, a neighborhood where liberal-minded folks with an intellectual streak and a little money live and play. If Ciglane seems an odd fit for homegrown cabaret, Mona Muratovic, an actress who regularly performs with Magacin Kabare, says that’s the whole point. Muratovic, who cuts a slim figure beneath a head of straight blonde hair, studied acting at Sarajevo’s Academy of Performing Arts. While living in Switzerland, she learned of the cabaret idea from Marjanovic, a former classmate and one of Magicin Kabare’s founders. A faltering relationship and a desire to do something innovative and artistic was enough to move her back to the city of her youth. The stage in Café Gogo is slim, ten feet wide by five feet deep. Tufted, ceiling-high black curtains form the backdrop. Guests sit right up to, and even on, the stage. The artists labor to elicit a response from the crowd. The line between performers and the audience is often blurred. Recent performances have included a monologue-laced musical told from the purview of a self-proclaimed Balkan loser, a blues opera dissecting local superstitions, and a comical peek into the antique love affairs that serve as inspiration for some of the country’s dark, melodically Orient-tinged folk songs. Performances occasionally spill from the stage into the streets. Last spring, on Sarajevo Day — a holiday that commemorates the liberation of Bosnia and Herzegovina’s capital city from the Axis Powers in World War II and more recently marks the tragic beginning of the city’s bombardment in 1992 — Magacin Kabare planned a surprise street performance near the vječna vatra (“eternal flame”) monument in the city’s historic Austro-Hungarian quarter. In the early afternoon, they filed out of a dark passageway and sprung themselves on passersby. Some, hair aged white with baby powder, propositioned senior citizens for a dance. Some dressed as police officers, marched into the crowded intersection, and handed lollipops, instead of tickets, through the windows of waiting cars. Some posed as beggars. They sat on the sidewalk, holding out their hands. Instead of asking for spare change, they gave money to those shuffling by. Others, wearing politician garb, washed the windshields of stopped cars and handed chocolate candy to astonished drivers. In a city where smiles are all too often hard to come by, the performance was a coup. Magicin Kabare includes nearly 40 artists. Apart from big names like Marjanovic — who recently landed the lead role in the Angelina Jolie-directed Bosnian war epic “In the Land of Blood and Honey” — the group also welcomes up-and-coming performers from the Sarajevo Academy of Performing Arts. Several young directors from the school, which is housed in a nondescript four-story building along the Miljaćka River, help produce the show. They, like the rest of the troupe, work for free. This, Kuduz says, keeps the art pure. Magicin Kabare’s weekly performances are also free, a development that has helped to make the group’s grand experiment a surprise success. On this cool autumn night, Café Gogo is packed. Cigarette smoke wafts around the space, the small ventilation fan at the top of a long taupe-colored wall unable to keep up with the rolling plumes. A single waitress snakes around the room, glasses clanking as she delivers cocktails to patrons seated at low, candle-lit wooden tables and paisley velour sofas, or standing like vertically-stacked sardines against the wall. As the lone actor steps on stage, the house lights dim, cigarettes and candles now the only flicker until a pair of harsh, bright spotlights wink on. Fog-like smoke dances in the narrow beams, an amorphous amoeba of burnt tobacco that rises and eddies around the room. Without expression, the actor looses an opening line, a familiar melody from a Balkan folk song. No quicker has he begun to sing that his voice falls silent. Like a fencer parrying against an opponent, he interrupts, launching into another verse just as the audience begins to applaud. Aglow in the spotlight, his forehead sheds beads of sweat. He scraps his sport coat, drapes it over the back of a chair. Quicker, ever wittier, and more animated with each line, he sings and stops as if asking the crowd a question, only to answer himself in song. He has the people off balance, in the palm of his hand. The gathering could be a group of friends huddled around a living room on a summer night, so personal, so affable is the vibe. This, in the end, is the charm of Magacin Kabare and their casual, intimate, populist brand of theater. Who wouldn’t want to have friends like these? Jarred McAfee is an American writer currently living in Sarajevo.